ACH transfers are the most common way to send or receive money online in the U.S. Wyre uses the ACH transfer system for payments to and from U.S bank accounts. Below is a guide as to how they work and how to use them on our platform. ACH transfers are electronic transfers that are processed by the Automated Clearing House network from one bank to another. This network is the biggest U.S payments system that offers low cost and reliable transfers. 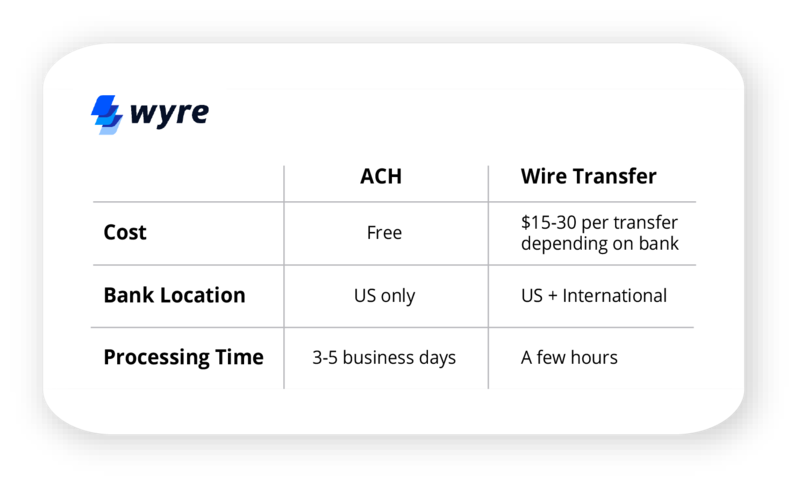 Unlike wire transfers which are processed in real time, ACH transfers are processed by a network operator in batches made only a few times a day. ACH debit transactions, or withdrawals, involve money getting “pulled” from your bank account. These transactions typically take 3-5 business days to complete. ACH credit transactions, or payouts, involve money sent from your Wyre account to your bank account. These transactions complete next business day. How long does ACH take? ACH debits typically take 3-5 business days to complete after initiating a transaction. On average, it takes 2 business days for the funds to settle on your end and another 2 to settle on ours. ACH credits take 1 business day to complete after initiating a transaction, so long as the transaction is submitted before the cut off time. The cutoff time is Monday through Friday, 12:00 PM PST. Business days are weekdays only, Monday to Friday, 9am - 6pm PST. Holidays and weekends are not counted as business days. When you place an order in the evening the ACH transfer is not started until the following business day. For more information on processing times, please visit our page here. 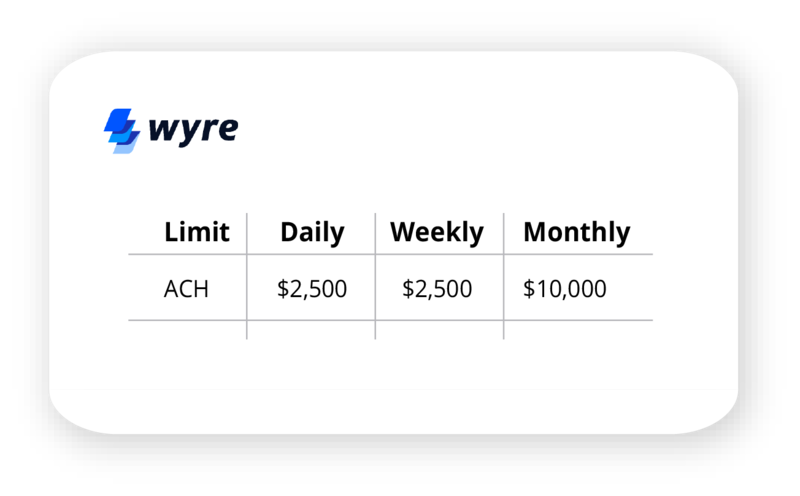 Below is Wyre's daily, weekly and monthly ACH debit limit. Users are not able to withdraw more than $2,500 per week. These limits cannot be increased. For Wyre dashboard users, the daily limit for ACH credits is $150,000. This limit can be increased but will need to be reviewed by the compliance team. For partner users, please inquire directly with our partner to learn more about this feature and their limits. When deciding which type of transfer is best, it all comes down to three major components: cost, bank location and processing time. ⚠️ Wire transfers are only available to Wyre dashboard users. Partner users are only able to use ACH transfers. ACH transfers are best for low-sum, non urgent transfers . Wire transfers are best for large-sum and time-sensitive transfers, either in the U.S. or abroad. There are exceptional cases, where we may require additional information and documentation after you've initiated an ACH transaction. If we're having a hard time verify the user's bank account details, we may ask that the user submits an ACH authorization form to authorize Wyre to withdraw funds from their bank account before releasing the funds. Please note that there's a limited time frame in which we can hold user funds. If we don’t hear back from the user, the transfer will be cancelled. If funds have already been withdrawn, they will be sent back to the user bank account. For questions or concerns, please email [email protected].